The main fabric is Here Comes Santa by Pat Yuille for Wilmington Prints. The white is a solid Kona Cotton by Robert Kaufman. 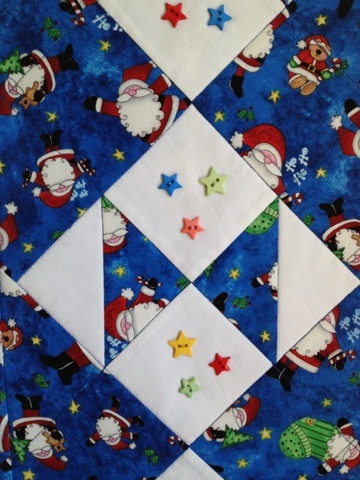 The star buttons are a package (yes, I used a full package!) by Buttons Galore & More. A little tip: I laid out all my buttons and glued them with temporary fabric glue to hold them in place until I stitched them so I wouldn't have to figure out their placement again and again.